Dang Good Carpet and Furnace Cleaning has been Crowned 2019 HomeStars Best of Award Winner! CALGARY, AB — We are proud to announce that we have been chosen as a 2019 “Best of Award” Winner by HomeStars. HomeStars considers this to be it’s highest honor. The Best of Awards was presented by DEWALT and Canadian Contractor. The award recognizes those who are considered the most trusted home service professionals in the HomeStars’ network. The HomeStars Network has over sixty thousand professionals. All professionals vetted and crowned for their commitment to consistency, integrity and unparalleled customer service. Karen and Mark from Dang Good Carpet and Furnace Cleaning attended this year’s Best of Awards on February 27th at The Commons in Calgary. Winners accepted their awards, and some had their photo taken with Nancy and then networked with fellow winners as a celebration of their incredible achievements. A “HomeStars Best of 2019” badge now appears on Dang Good’s profile. This acts as a sign of their commitment to quality, showing homeowners they’re a top choice for their next home renovation or repair project. See what customers have to say on HomeStars: Profile Page. Join hundreds of happy clients who have made Dang Good Carpet and Furnace Cleaning their first choice for hire. We are delighted to see that we are the first Cleaning Service Business to list on the new Airdrie Exchange site. Airdrie Exchange is a Movement and Local Business Directory promoting events and business for the residents of Airdrie Alberta. It is open to any business with a license to operate in Airdrie. Our picture shows the main image currently on their Website and we have a link to their site below. 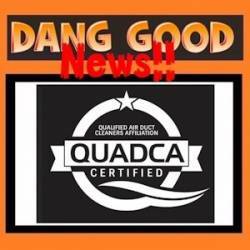 Dang Good Carpet and Furnace Cleaning is proud to be associated with this new movement. Airdrie Residents are for sure, some of our most favorite customers, so it seemed only fitting to get involved. The mission for this movement includes Collaboration and Connection within Airdrie. Please see their “About Us” Page for a full mission statement. The “Connect” tab already lists a number of local events. In line with a number of initiatives that Dang Good has got involved with, this is a family focused project. Airdrie is a growing and thriving town and we are proud to become a high profile company in such a wonderful community where we have received so much business already. Lindsey has started a blog on her site which can be found under the tab “Grow Airdrie.” We wish Lindsey and Airdrie Exchange every success. We are extremely proud of our latest Facebook Milestones. We first noticed back in June 2018, that we came up on Facebook as “Most Recommended Carpet Cleaner in Calgary.” Today October 7th 2018 we are proud to continue with the same status. And with tomorrow being Thanksgiving in Canada, it is something we are very thankful for. This week we also reached 1000 Likes on our Dang Good Facebook Page too. We are grateful to all those that believe in us and our Carpet And Furnace Cleaning Services. We continue to be popular with locals in Calgary, Chestermere and Airdrie, Alberta. The BBB has awarded Dang Good Carpet and Furnace Cleaning an A Plus Rating. An A+ with the Better Business Bureau is the highest achievable rating. Subsequently, it doesn’t get any better than that. We are delighted and optimistic that, as a result of achieving A+ we will attract more customers. We are very proud to have accomplished it. Naturally we wanted to tell you about it. Our Company is an Accredited Business. We recently renewed our annual accreditation. As a consequence we had to comply with the Eight Standards the BBB sets as principle elements of good business. Accreditation builds confidence with our existing and potential customers. Gaining Customer Trust is paramount to us. Many customers turn to the BBB to ensure that the services they request are come from a credible company. Subsequently, the Better Business Bureau helps clients make informed decisions when hiring contractors. Or simply go to our Deals Page for some great prices if you need a basic clean. Mommylicious holds a number of events in various cities around the Province of Alberta. Each Local Vendor gives a Door Prize – see below. We look forward to hearing who won our Door Prize: A Certificate for One Whole House Carpet Cleaning Package, Valued at $150.00. For those who were not so lucky, please feel free to check out our Deals Page for some great prices on Carpet Cleaning and Furnace Cleaning. 10th ANNUAL – Best of Airdrie Award! 雷Bronze – Best Furnace & Duct Cleaning. Each Year Readers of Airdrie City View are able to recognize and vote for business they love by completing a survey. We are honored and humbled that Airdrie Residents have recognized us in this way. We published an official “Thank you" in the Special Pullout Section of the Airdrie City View on page 51. You can find the Special Pullout in the insert in the Airdrie City View Publication dated Thursday September 13th. We also shared the “thank you" on our Dang Good Facebook Page. This means that all our Legal and Professional Documentation is in order. Hire us and you will be employing a credible, trustworthy business. Check out our Reviews Page to see our latest HomeStars Reviews.